Upscale Mexican restaurant Hablo Taco is the latest addition to Tampa Bay&apos;s Channelside Bay Plaza. Offering Mexican "Sol" Food, the menu is written in laid-back Spanglish. The doors open at 4 p.m. How do you say "Happy Hour" in Spanish? 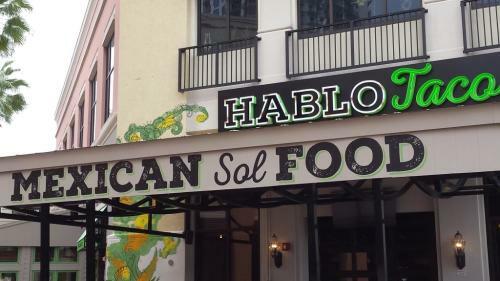 Hablo Taco is part of the reinvention of Channelside Bay Plaza under new owner Jeff Vinik. Vinik also owns the Tampa Bay Lightning, whose mascot helped with the ribbon cutting. Hablo Taco&apos;s menu promises roasted corn on the cob with spice mayo, tacos with everything from pulled chicken to pork to steak, along with quesadillas and burritos featuring Aztec hot sauce. As the menu proclaims: "Here&apos;s a taste of things to come. But this isn&apos;t the whole enchilada."